Did you know that the first stock ticker and ticker tape was used way back in 1867? Since that time, trading technology has come an incredibly long way. With the relatively recent creation of electronic trading and margin trading, day trading has become even more popular. This is especially true among at-home traders. As Business Insider points out, however, only 20% of day traders will make money as a result of trading. 1% will be able to do it well enough to make a sustainable living. Having a sense for the markets and knowledge of economics is certainly an important factor when it comes to day trading. However, the computer you use can have a huge impact on your successes and failures. 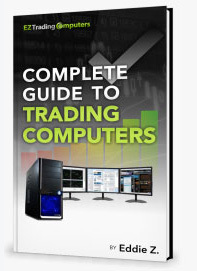 Here are three ways to find the best trading computers. Because day trading deals with numbers, calculations, and predictions having to be processed at an incredibly high rate all day long, the fact is that an ordinary computer likely lacks the processing, memory, and spacial capacity that a real time trading system requires. As a matter of fact, in order for a computer to be certified as a computer for traders its processor has to pass a benchmarking test that clocks it at a certain speed. If your system cannot process information in real time, how can you expect to trade at similar speeds? Various proprietary software offered from companies like TradeStation, NinjaTrader, MetaTrader, etc have relatively high system requirements. You can’t just use your 10-year old Windows XP system that’s squeeking by on 2MB of RAM. Many day trading strategies, like scalping and arbitrage, require sophisticated software. Does the trading computer setup you are looking into come with trading software pre-installed? Does it have the ability to adequately handle the load of that software? If the answer is no to either of those questions, you likely are not looking at the best trading computers. Many day trading professionals utilize multiple monitors so that they can keep track of all the relevant information as it is made available and make decisions on the fly. Incredibly, many also utilize multiple computers! As TradingSim writes, many top day traders use systems use four monitors at once. If you are looking to become a successful trader, consider investing in a system that lets you see every bit of info at once. When you are looking for the best trading computers you have to be aware of three things; speed, ability, and visibility. Looking for a day trading computer that passes processor speed tests, has top notch software, and features two or more monitors will put you on track to a successful career in trading. What are you waiting for?